Fans of the Cult TV series "The Avengers" (which in many episodes guest starred many actors and actresses who appeared in "The Prisoner") will be pleased to hear that in addition to Mike Richardson's recent book (see news item below), another has been published. 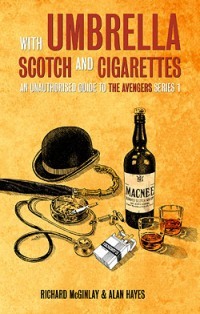 "With Umbrella, Scotch and Cigarettes" by Richard McGinlay and Alan Hayes is a fantastic follow up from Hidden Tiger Books to their earlier "Avengers" book "The Strange Case of the Missing Episodes", and looks again at the show’s first series but this time from the perspective of its production, transmission, personnel and reception. The book has been compiled with reference to internal ABC production documentation and communications, scripts, press archives and library collections, and in co-operation with a number of people who worked on the series. The book can be ordered via Hidden Tiger Books HERE. For a limited period, the book is reduced in price and a further 15% can be saved on print versions with the promo code FWD15. This discount and code does not apply to sales via Amazon. Lulu have also issued a free shipping code which runs until Tuesday 11th November at midnight. The code is HSQ2 and it can be used in conjunction with the FWD15 code.